I do not want to call these two people and their situations equal, but there are a lot of similarities in the way they are being treated that are disturbing. I do not care if Mr Snowden broke a secret law that none of us knew about. He got some “truth” out to the American public of which they had no clue. Everybody wants his head including the Repub & Dem leaders in Congress, the leaders of the Administration and every other “serious” person in the Known World. Ms. Deen admits to saying something twenty plus years ago. 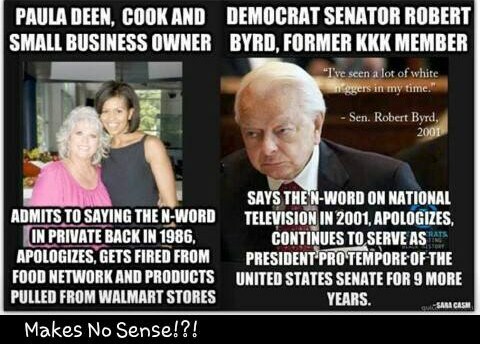 At least she wasn’t a Kleagle (recruiter) for the KKK as Sen. Byrd (D-WV) was. Yet Ms. Deen is been cut lose by myriad large corporations in a business decision so they won’t be tainted by associating with her. When it comes to the beliefs that I defended during my 21 years in the U.S. Navy was the belief that everyone should be listened to and everyone deserves their day in court. I got the picture below from my 20 year old granddaughter. Could it be that men do not want women to attain too much money (power) ? Think Martha Stewart. Rally to Restore . . . There is a lot of negative bits and bytes about the Jon Stewart/Stephan Colbert get-together on the Mall for three plus hours on Saturday 30 Oct here, here and here. Now, the folks that are critizing the event are people I respect. I read their blogs everyday. Yet, I feel that they have this all wrong. The message that I got was “T O L E R A N C E ” Be tolerant of your country men and women. They have the same rights as I do. Contrary to much speculation on the right, he kept his critiques balanced. He addressed Americans of all stripes, specifically noted that his intention to heckle those with which he has openly disagreed– in fact, his only intention was to dissuade those with the power of mass communication from doing so, constantly, on a daily basis. Those who paid attention to Glenn Beck’s speech at “Restoring Honor” will be hard-pressed to find much of a difference at the core of both their speeches, that core being that Americans are truly good and care for one another, and that the only way to get through these difficult times is working together. Beck often describing himself as a bit of a Jon Stewart figure, the fact that it is now Stewart mirroring Beck’s message without much of the excess baggage that being Beck entails seems appropriate. Unlike Beck, however, there is an immutable truth about Stewart that, while not strong enough to make his words hollow, lend no weight to his message: if those shouting heads on cable news stop shouting, and Americans start working together for the greater good of the nation, Stewart (and Colbert) would be out of a job in a heartbeat. Stewart was right to anticipate that, as a “comedian-pundit-talker-guy,” there are boundaries to what he can say without sounding at some fundamental level hypocritical. The challenge for those Americans who listened to Stewart is to let the words do the talking– that “we know instictively as a people that… we have to work together,” that there will always be darkness, as there will always be New Jersey, but it doesn’t have to define our lives– without letting the impulse to evaluate Stewart ad hominem dilute his message. Tea Parties are for little girls and their invisible friends. I watched the entire rally on C-Span and thought the overall message was that we do not live in a black-and-white world and most things are not as simple as they are made out to be, as in the appearance of Kareem, with Colbert acting as if he did not know that he was a Muslim. A treat was seeing Josef (Cat Stevens). The last I had heard, he was not allowed to enter the country. Seeing him gives me a little hope. I am new to Facebook. Less than 48 hours ago I joined. B, a long time family friend, bugged me to join so I could see pics of her first and only granddaughter. One of the reasons I had never joined any social networking was because of privacy issues. So, when I came across this NYT story today, via The Moderate Voice, I checked my settings and found that only the last one could have caused more grief than I need. While you may think these sorts of items aren’t worth your time now, the next time you lose out on a job because the HR manager viewed your questionable Facebook photos or saw something inappropriate a friend posted on your wall, you may have second thoughts. But why wait until something bad happens before you address the issue? Considering that Facebook itself is no longer looking out for you, it’s time to be proactive about things and look out for yourself instead. Taking a few minutes to run through all the available privacy settings and educating yourself on what they mean could mean the world of difference to you at some later point…That is, unless you agree with Facebook in thinking that the world is becoming more open and therefore you should too. out where all the hate comes from. First we have Pat Robertson with what is not only a hate filled comment but also one that makes me wonder about the mental abilities of those folks that watch and donate to his 700 Club. They must be both stupid and consumed with hate. And the Fat-Bombast-Obese Lying Drug-Addicted Pimpled-Buttock-Draft-Dodging America-Hating Viagra-Enhanced Race-Dividing Scroogelike-Loser otherwise known as Rush Limbaug that makes $30 million a year is reported at the Huffington Post to have said different but equally hate filled comments on his radio show. This picture of our home is one of the top 10 astronomy pictures of the year and more info can be found here. Rosetta is an impressive European spacecraft on its way to the unlikely-named comet 67 P/Churyumov-Gerasimenko. Once it arrives in 2014 it will extensively map the comet’s solid nucleus and, incredibly, even deploy a lander which will take close-up pictures and sample the comet’s material. Comets are on orbits that can make them difficult to reach, so the gravity of planets must be “borrowed” to get the probe to its destination. In November 2009, Rosetta swung by the Earth for its third and final assist. 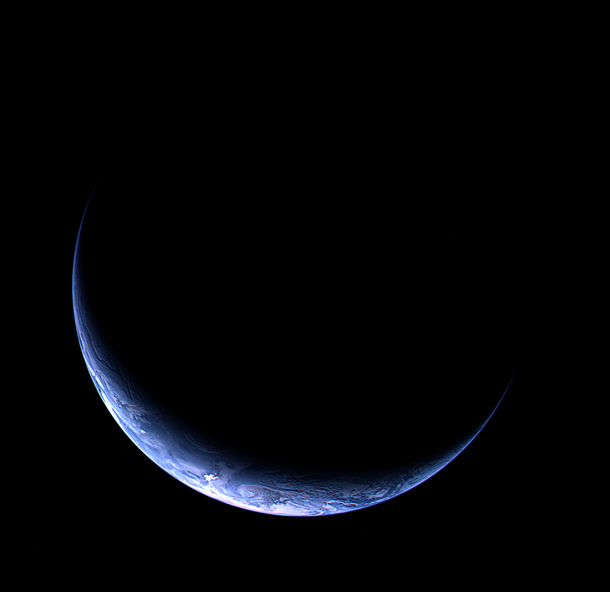 While it was still over 600,000 km (360,000 miles) away, it took this remarkable image of our home. I look at pictures of Earth from space every day, and it’s easy to forget how special our world is. Pictures like this remind us how stunning and beautiful it is. And better yet, in my mind, the crescent shape is so similar to the way we think of the Moon and Venus that’s it a strong reminder that we are but one world of many, a planet both mundane and special, ordinary and unique. Plus, I’m a sucker for home pictures. Sometimes I just must get away from politics.